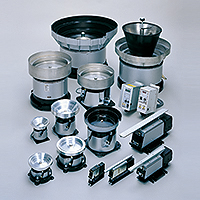 Parts feeders are designed to store, align and supply a wide variety of parts. With high-speed, high-reliability, space-efficient and energy-efficient designs, they are used on various types of manufacturing and inspections lines. Parts feeders are simple devices consisting of leaf springs, electromagnets, vibratory vessels and various other parts, but play critical role aligning and feeding parts for a diverse range of production technologies. There is growing demand for faster and more reliable parts feeders with easy maintenance.